I think we posted sort of similar things about resolutions on each of our blogs and I love that. I love that you chose Joy. I think I'm going to embrace that this year too. 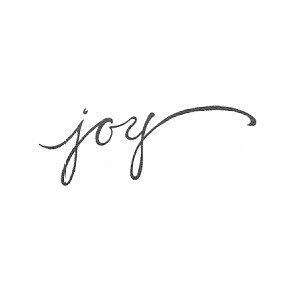 Everyone needs Joy and it's super hard to see and find but it's definitely something I know that I need. I have been thinking of doing like a weekly post of that week's "joy." So like each day write down a few things that made me happy or were good or brought me joy and do like my Little Bits of Happiness type posts I did before except the whole week combined into one blog post each week - does that make sense??? Anyway. I love you. Lots. And I am really proud of you. And you are like one thousand times stronger than I am. And I hope this new year brings you more joy then you could ever imagine. Also, I'm pretty sure your mama is amazing and gives the best advice and should write a book. I'd buy it. Love you! Praying for you! Also, blog more often, please and thank you. We need to know about any fire alarms that go off. We are missing out. DON'T LEAVE US IN THE DARK, ASHLEY! Please blog again. I miss it dearly.